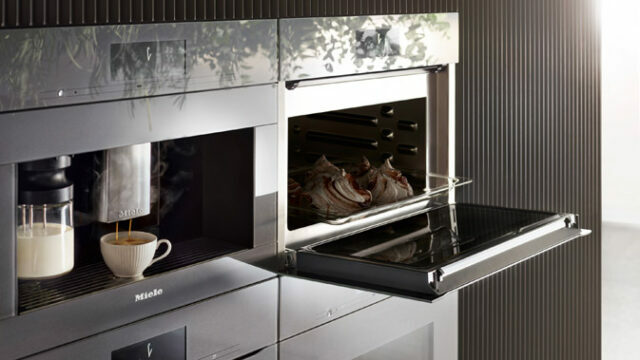 GÜTERSLOH, Germany — Miele shows how the enjoyment of coffee can be increased with Generation 7000 built-in coffee makers. The top CVA 7845 model has an on-board supply of up to three different types of beans, brews each cup without any cross-blending, descales automatically and dispenses with the tiresome job of having to clean milk lines and degrease the brew unit. Thanks to a complete redesign, these coffee machines are even quieter than their predecessors. Further details exclusive to Miele are a cup sensor which aligns the spout with the height of the cup or beaker and performance modes for currently preferred settings. The coffee machine offers 25 different specialities, including tea, each brewed at the ideal temperature. The three beans containers (300 g and 2 x 150 g) come into their own when selecting specific beverages: a long black, for instance, ideally requires a strong espresso; a Caffè Americano is best prepared with a milder coffee blend. With the Miele Black Edition, the company offers four select blends: Café Crema, Espresso, Decaf and the All-for-One allrounder. To ensure that each type of coffee is delivered without unwanted blending, the grinder is designed and arranged in such a way as to guarantee that only freshly ground coffee reaches the brew unit (AromaticSystemFresh). To add a personal touch, Miele coffee machines feature 10 user profiles. Depending on the beans and the beverage, various settings relating to the degree of fineness, the quantity, the temperature, pre-brewing yes or no, have an immense impact on flavour. After a spot of trial and error, favourite beverages are easily programmed. Furthermore, it sometimes makes sense to quickly adjust settings to reflect current requirements. For this purpose, the CVA 7845 now offers four performance modes. These optimise basic settings for continuous operation, for instance for a party (Party mode) or Eco mode, the default setting, for the lowest possible energy consumption. In Barista Mode, the focus is on adjusted extraction times for coffee and a perfect espresso crema. And, finally, Latte Mode speeds up heating as milk-based beverages require shorter preparation times anyway. But real enjoyment and pleasure comes with relief from the chores associated with coffee. This is where AutoDescale, the automatic descaling function, provides assistance – a feature integrated on top countertop models for the first time in the form of a cartridge. On built-in appliances, this descaling function has once again been optimised and requires approx. two hours (usually overnight). Manual descaling is always an option. Even more of a chore than descaling is the frequent need to clean milk lines and degrease the brew unit. The AutoClean function does release users from their responsibility. As with automatic descaling, detergent is introduced using a further cartridge, allowing alternating degreasing and cleaning. Here, too, the actual amount of coffee used determines the intervals at which cartridges need replacing. AutoClean and AutoDescale are exclusive, patented Miele features. The Miele@mobile app allows a machine to be configured by for instance defining the parameters of beverage preparation. Switching the machine on, starting beverage preparation, or simply showing the machine care status – these are all functions supported by the app. Naturally, detergents and descaling agents as well as the exclusive coffee blends can be ordered from Miele’s online shop straight from the app. The CVA 7845 is the flagship model of a range comprising four models. This model features a water supply connection (DirectWater), dispensing with the need to fill a water tank, and is available in graphite grey, obsidian black, brilliant white and stainless steel. The corresponding model with a water tank is the CVA 7840, only available in PureLine design. Further models are the CVA 7440 and CVA 7445 (DirectWater) which do not incorporate all the above features.